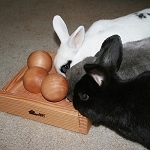 Linnea has 2 treat recesses that challenge your rabbit to lift each lid in order to reveal its prize. 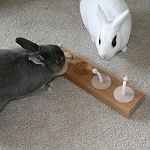 Watching your rabbit puzzle it out, make the connection, and be rewarded with a treat is enthralling. Linnea comes with a small bag of Bunny Bites, which fit neatly into the recesses. I mastered this thing very quickly; obviously the sign of a true genius. Pulling the pucks out individually is child's play. I now am working on a technique of grabbing the base and flipping the entire toy over at one time, thus removing both pucks in a single effort, allowing access to both treats in less time. When I see the IQ Toy, I run right up and try to flip it over. When that doesn't work as quickly as I'd like, I immediately pull the pucks out by the rope. Don't let the toy elude you; the pucks are the secret to achieving the treats. Just because they are laying beside the toy, doesn't mean they will stop producing treats. I continue inspecting the pucks and moving them about, waiting for them to give up more of their bounty. My rabbits get these every night as their last treat. They love them! This is a wonderful toy for a rabbit that isn't the smartest little girl in the world. She had it figured out in about three seconds. It really is a great toy and Rayne loves it. She also throws the tops around and plays with them after finding her treat. Recommend highly. Robert has figured it out, Amy is still working on it but they both like tossing the lids and know that treats are inside. 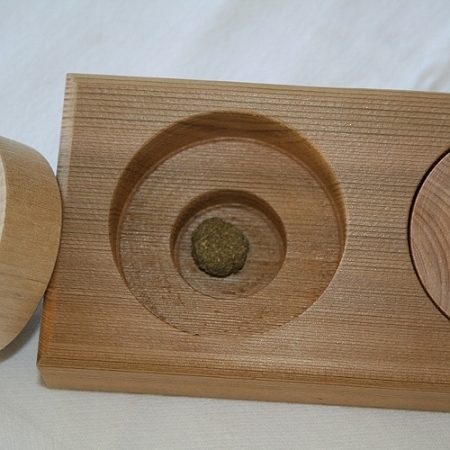 Nicely made product. I had high hopes for my rabbit to join the legions of rabbits who had shown their IQ in figuring out the trick of getting the treats under the lids of a Linnea, but I'm sorry to say my bunny, who gripped the ropes in his teeth at first, has not followed through to lift them to reveal the treasure underneath. I've tried putting treats in the recesses and leaving the lids off and he gobbled them up then, but when the lids are on, the most he'll do is sniff around the lids and then leave them alone. I think it's a great idea, as numerous other bunnies have demonstrated and I still have hopes that he'll discover the trick one day. Best $10 money can buy. I love watching my bun with this toy. It makes me laugh every time she lifts the lids to get her treat. She figured it out after a couple of tries and now she runs to it when I put it down for her. 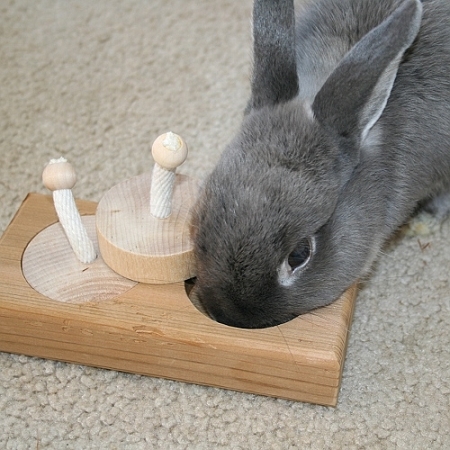 I love watching my bun play with this toy, she was able to figure it out in the first try . she has fun picking the lids off the box to get to her treats aka timothy pellets or a dried pineapple treat... and I enjoy watching her do it ! I wasn't sure if our disabled bunny (with head tilt) would be able to figure out how to open the lids but she did in less than 3 days. This toy could not be more fun. 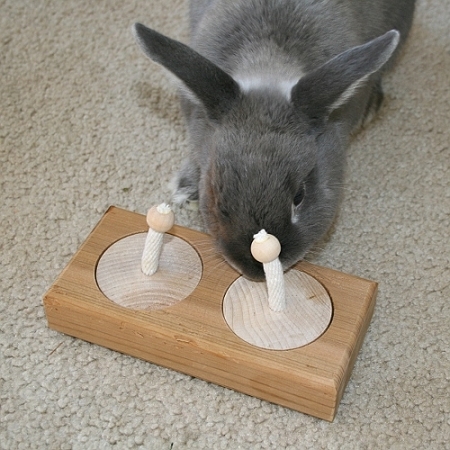 What a great thing to keep a bunny entertained! Hopwell loves this dispenser. It's the first thing he goes to when he's fed, likely because the fun food goes in it. He whips the lids off faster than I can get them on. In his eagerness to get at the food, he has flung the lid down his ramp or into his water dish (the lids don't fit the holes until they dry out again). This is the second one I've bought. He got the ball off the end of the rope handle of the first one and frizzled the rope to death. He also chewed down the base some.